LOS ANGELES , April 2, 2019 (Industry Intelligence Inc.) – Better stock up on avocados, because if President Trump has his way, you may soon not be seeing it in stores. According to numerous industry officials, U.S. consumers would run out of avocados in three weeks if Trump makes good on his promise to close down the U.S.-Mexico border. The U.S. is heavily reliant on Mexican imports of fruit, vegetables and alcohol to meet consumer demand. According to data from the U.S. Department of Agriculture (USDA), nearly half of all imported U.S. vegetables and 40% of imported fruit are grown in Mexico. “You couldn’t pick a worse time of year because Mexico supplies virtually 100% of the avocados in the US right now. California is just starting and they have a very small crop, but they’re not relevant right now and won’t be for another month or so,” said Steve Barnard, president and chief executive of Mission Produce, the world’s largest distributor and grower of avocados. 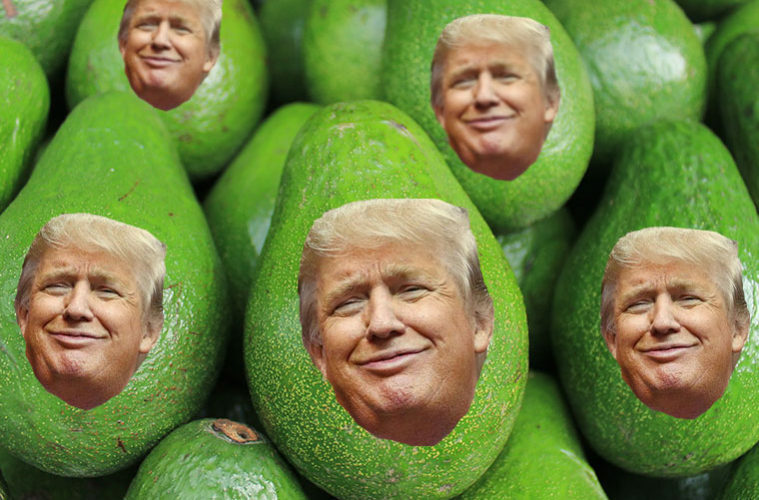 Now avocados wouldn’t be the only item affected in the event that Trump closes the border. The majority of imported tomatoes, cucumbers, blackberries and raspberries come from Mexico. Beyond food, Mexico is the largest importer of US exports of refined fuels like diesel and gasoline. All totaled, the U.S. and Mexico trade about $1.7 billion in goods daily, according to the U.S. Chamber of Commerce, which said closing the border would be “an unmitigated economic debacle” that would threaten 5 million American jobs. But back to avocados. I love avocados. More specifically, I love guacamole. I use it on almost everything, even hot dogs (don’t judge me). Losing my beloved green fruit would be an unmitigated disaster for me personally, as well as my guacamole-loving peers. At the risk of getting political, virtually no one with any actual knowledge of trade or immigration policies believe that Trump’s threat to close the border is a good idea. And now with avocados potentially under siege, this threat is hitting really close to home. Keep the border open! Jobs won’t be threatened, trade won’t be curtailed and most importantly: I’ll still have guacamole for my hot dogs.